Vintage Generation. Some people call it “Vintage Generation”, others brush off the most fashionable style at the moment defining it “gender”, ignoring the meaning of this word. In the second case, this is a label given with negative meaning: ignorance produces confusion. For the may issue of Style Magazine we met and photographed Thomas Cohen, “songwriter, dandy, bohemian from London”; a rising talent that look like he’s just left a cover of a Bowie’s or Jagger’s disc. But let’s talk about this trend that, instead of emphasizing muscles and wide shoulders, focus the feminine side of men (in both men and women, hetero or homosexual, coexist a feminine and a masculine parts). Michele (Gucci), Maier (Bottega Veneta), Venturini Fendi and Prada (Miuccia has been a forerunner), has created collections inspired by the 70s, bringing back to fashion a combinable/decomposable styling. A mosaic that reminds us the most refined looks of the stars of the day. Avoiding denim. 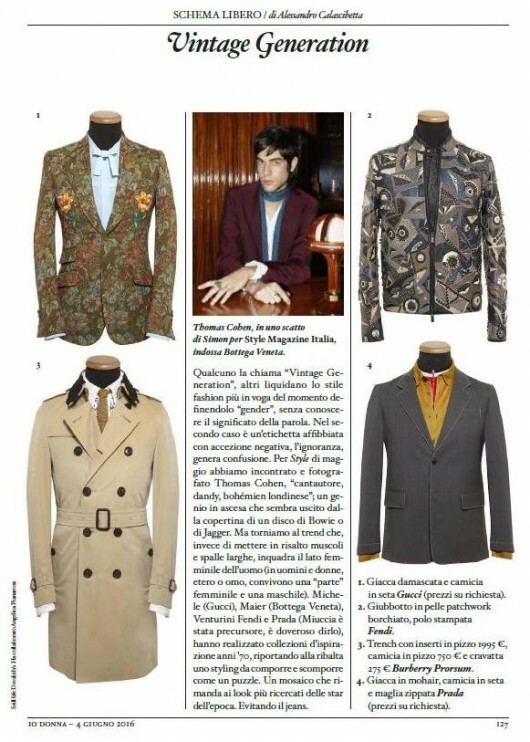 Thomas Cohen, in a picture by Simon for Style Magazine Italia, wears Bottega Veneta.